Note: This contest has now ended. Congratulations to Meera, lucky #2! Thanks to everyone for entering and sharing your favorite Indian dish! I have some fabulous new ideas. I neglected Hungry Desi’s first birthday. And then its second birthday. So I am ringing in my 100th post to Hungry Desi with a giveaway. A little thank you to all of those who make it fun for me to blog about cooking Indian and vegetarian food, to those who read about my adventures in feeding my new daughter and who try out a recipe and are kind to let me know how it turns out. And a welcome to those of you who may be new here! The contest rules are simple. To win this Le Creuset Stoneware Mortar and Pestle , just leave a comment telling me your favorite Indian dish. You can get up to two additional entries (for a total of three entries) if you share a link to this contest on your blog, Twitter or Facebook or add Hungry Desi to your RSS Feed. Don’t forget to leave an additional comment on this post for each additional action. For example, you might want to tweet: @nithyadas is giving away a le creuset mortar and pestle on hungry desi. leave a comment at http://tinyurl.com/6cyp6hd to win! A winner will be selected via the random number generator next Friday, February 4th at 8:00 pm EST and then I�EUR(TM)ll arrange to have theses items shipped to your home. (Note: Unfortunately, this is only open to U.S. residents). Best of luck! I love your blog Nithya! My favorite indian dish is sambar. Yum! Congratulations on your 100th post!! Fave dish= dahi baingan. Cooked to perfection at Bukhara Grill in NYC. Bhel Puri. I live in DC now and its harder to find on menus, but whenever I see it, I always order it. Thanks for the NYC fav’s list. I’ll check ’em out next time I am in the City. It’s also a good introductory dish to people that are not sure about Indian cuisine. Congratulations….my favorite Indian dish is Paneer tikka…thanks for this giveaway…. Congrats on your 100th post. My all time favorite dish is Hyderabadi Bagara baingan..
Congratulations on your 100th post! My favorite is dum biryani, chicken or mutton. Congrats Nithya. My favorite dish is chicken biryani. I love Tandoori Chicken! YAY for 100 posts! My favorite Indian dish is Pav Bhaji. Thanks for the giveaway! Yay!!! I have to agree with one of your posts about the sides being more important than the dish! Raita and tamarind sauce are essential…. But I’ll go with baighan bharta or bhindi masala. I love tandoori style tofu! -Fresh naan. Seriously, what could possibly be better than hot fresh naan, straight from the tandoor? Thank you for this blog! I love malai kofta & tandoori shrimp. I found your blog by searching “nutella”! I am enjoying browsing through the recipes. My favorite dishes are my mom’s uppama and lemon rice. All the best! Thanks for the chance. I was just making something out of Dakshin the other day and was wondering what the masala would have been like with a mortar and pestle instead of an electric grinder. Love Le Creuset! And favorite Indian dish = black-eyed pea curry! Hey! Congratulations on yoiur 100th post! My favorite Indian dosh would be Palak Paneer – Anytime!!!! My favorite Indian dish is Murgh Tikka Haryali. Thank you for the opportunity to enter. I am following your RSS Feed. I love Naan – but that isn’t really a dish, is it? I’ll go with chicken biryani. This is really tough. I love love all kinds of Indian pickles, especially the southern varieties but…. I am ravenous over samosas. I learned how to make these fried, puffy “dumplings” in college and have been addicted ever since. I’m grateful to live in Chicago where I find they’re plentiful on the north side. I love the essential spice section! My favorite Indian dish is Palak Paneer, but I’m thinking your honey butter brussel sprots are an easy second! Hi, I linked you to my facebook page. I’ll see if any of my cooking friends show up here and comment! So hard to decide – that’s why I always way over-order when I get Indian food. I think a good dal makhani is my fave, though. I love starting off with Samosa Chaat. Next, either a Chicken Vindalu or Chana Masala….served with fresh Naan, of course. Finally, a Mango Lassi to finish thing up. Liz, I’d love to hear how you make the stuffed rice flour and coconut dosas. 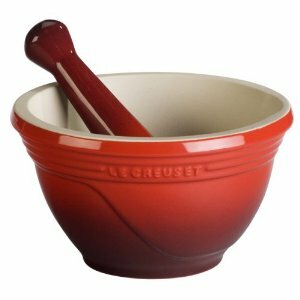 Want a le creuset mortar and pestle? @nithyadas is giving one away on hungry desi. Leave a comment at http://tinyurl.com/6cyp6hd to win! I’m following your RSS Feed! Hard to pick one. My mon’s methis alu sabzi. For me, naan and seekh kabab is so simple, but one of my favorite things of all time to eat! i added Hungry Desi to your RSS Feed. Le Creuset Mortar and Pestle â€” hungry desi <Loved it!